That card is in hand - I didn't grab that off the net. Had to run to Target (yes - this was a had to) and someone put out the cereal boxes and the blasters. No loose packs. So I bought a hanging box. Let's have a quick look. Back of Jeter's card. Not sure how much of the backs have been previewed. Easy to read number, and the series label too. Complete stats. 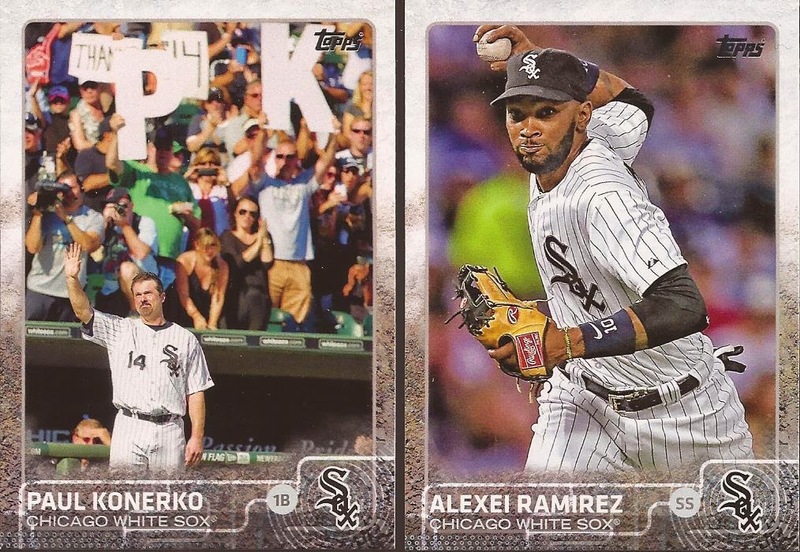 Pulled two White Sox. 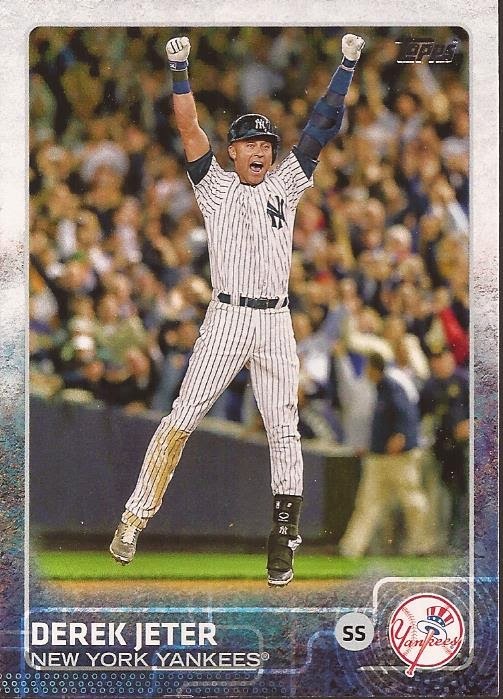 Thank you Topps for a proper final card for Paulie. If you don't use him again, it's much better his last card is a common in flagship and not a short print in another product. Dig those easy to read names and almost complete lack of foil. 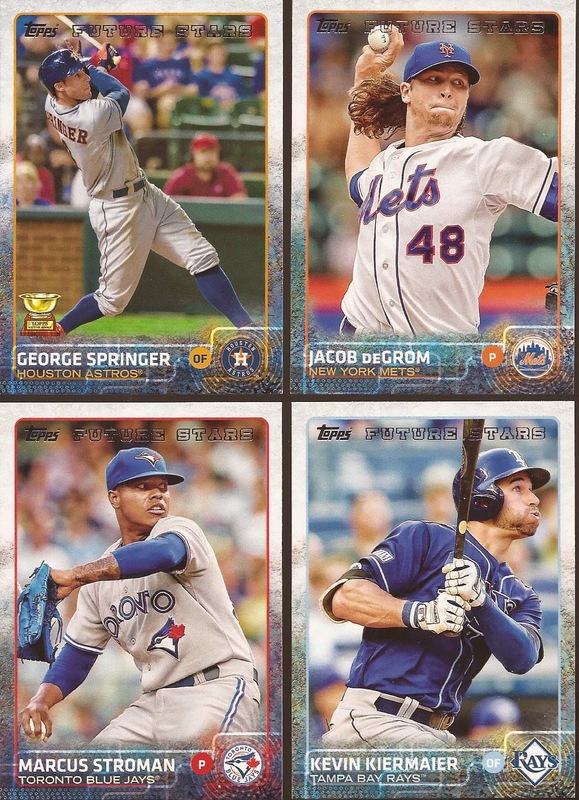 Dammit Topps - DON'T MAKE ME LIKE 2015 FLAGSHIP!!!!! Three for the binders. Of the 72 cards in the brick, not a single throwback uniform. Disappointing! Future Stars. The rookie cup is a plus. The crappy foil printed "Future Stars" is bad. Very, very bad. These are not checklists. But damn - I like these! Granted, all three of these teams made the post season. I assume all 30 teams get a team card like this. The Rosario is a gold. 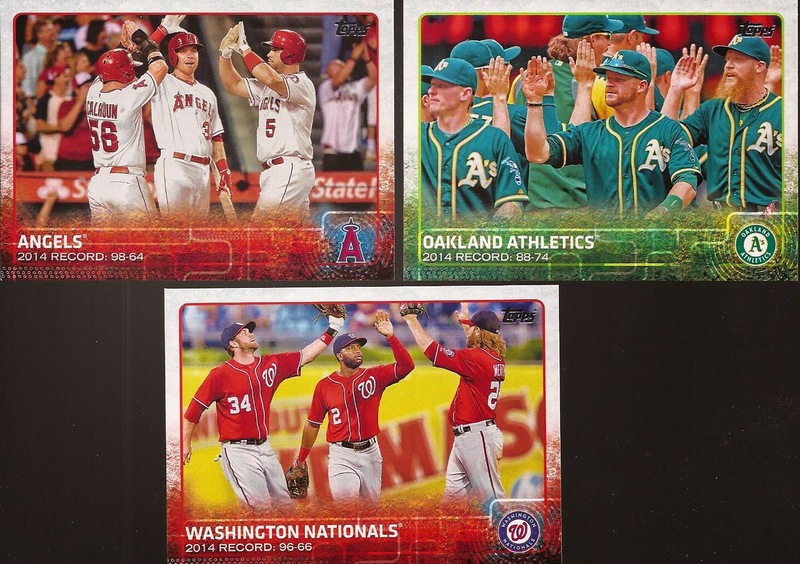 That Davis in the middle - think of the card printing similar to Bowman Platinum. I happened to pull a base of Davis, which is the card on the far right. Not sure the name of this parallel, but I am sure it is not needed. The First Home Run cards were the last two in the brick. Love that the Tulo is a picture of him possibly from that game, as he is certainly not number 14. I love the idea of the first pitch. What I don't love is that the set doesn't have a lot of diversity. Three Cubs cards out of 15? That's like Yankee-type sorting. Last inserts. That Schmidt is very 8th grade layout. Bad design. Nick - you are going to LOVE that Robbed in Left insert. And the Archetypes is too busy. Add two move colors and it's '95 Fleer all over again. There - didn't say much because I wanted to hit publish. So "publish". Khris Davis getting another fielding picture is interesting...I mean, the guy is hardly known for being a fielding wiz! But you are right. These cards are making me like flagship for this year. I am pretty stoked for this set! Dude. Two days early. I'm putting that Paulie card up for "card of the year". Early entry, but that's a darned good sunset card. 1. The Khris Davis is snow camo. 2. the First HR cards are of the player actually hitting the home run, or a damn close as I could find in Getty images 3. WOOT! It's not enough that Chicago has all the card shows? Thanks for sharing! Cool stuff, I agree on the future stars cards though. Yuck. Excited to try some myself soon! Love it! Really excited for this set. Awesome. Getting excited for the Nachos Grande break now. 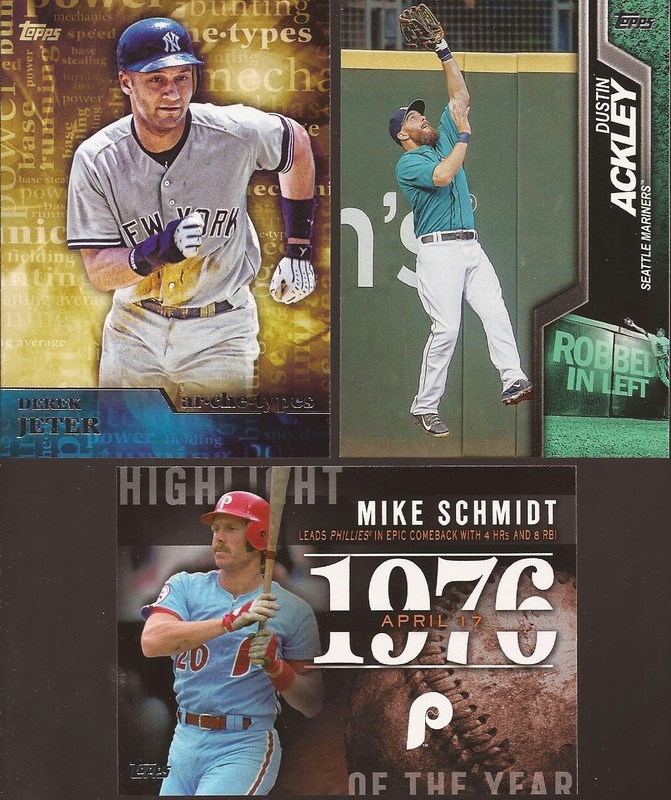 Inserts are forgettable (except the "Robbed in Left" series), but, my goodness, do the base cards look nice. That Paulie is the very definition of what a sunset card SHOULD be. Simply beautiful. 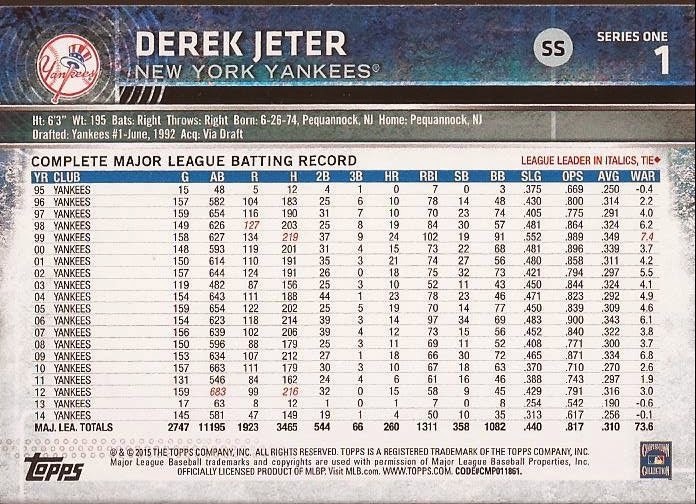 Jeter card #1 annoys me less with Konerko also in the set with a post-retirement card. I think I like the 2015 design... we'll see once I'm able to get some cards for myself. Boo to gloss. I would even consider collecting the base set if they had a matte finish. The good news is that there seems to be not many Cardinals cards in Series 1. Fewer things to buy! And so it begins!!! Going to have to visit Target after I drop off the kids. #ThanksTopps!!! Very nice! I'm happy that the little All-Star Rookie Cup is still there (I'm hoping to re-complete the set now that 2015 Topps is "almost" out). New is new good stuff to get signed! yay hope there are a bunch of new players on cards.